DFG Tuning MQB Intake System (15+ A3,S3,GTI,Golf,Golf R) ? DFG Tuning took at look at the factory turbo inlet found on the 1.8T & 2.0T Gen 3 motors. The factory turbo inlet is a choking point before the turbocharger. This leads to the turbo having to work harder to produce the requested boost levels. 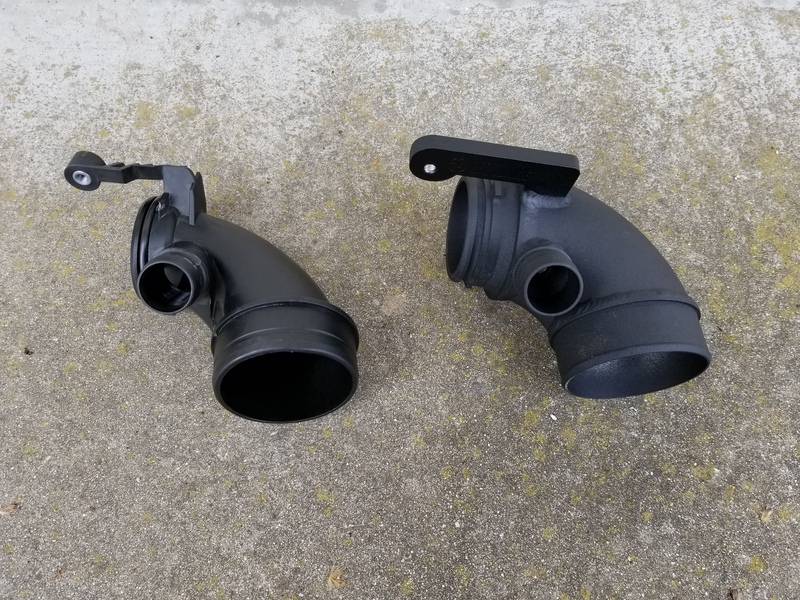 DFG Tuning has replaced that restrictive piece with a turbo inlet made from mandrel bent aluminum piping and T6061 aluminum. 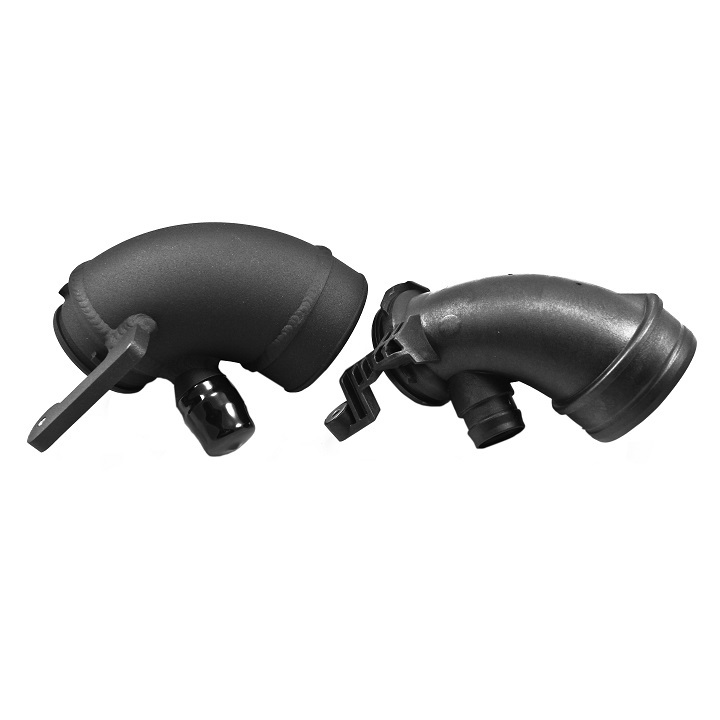 The DFG Tuning piece features a smooth transition into the turbo and a black powder coat finish for durability and longevity. This will increase airflow allowing for more power throughout the powerband. Limited Warranty. DFG Tuning LLC warrants to the original retail purchaser who retains ownership of the vehicle on which the Product was originally installed (the “Consumer”) all of its DFG Tuning products. Standard DFG Tuning products carry a 1 year warranty against manufacturing and/or material defects, unless stated otherwise on individual product listing on this website. Exclusions from Warranty. This warranty shall not apply to any Product that was not properly installed by a qualified, licensed auto mechanic experienced in the installation of the Product purchased, any Product that was improperly serviced, or any Product that was misused or damaged (if such damage did not result from a Product defect or malfunction). This warranty shall not apply unless the Consumer promptly discontinues use of the Product upon discovery of the defect or premature wearing. THIS WARRANTY DOES NOT APPLY TO ANY PRODUCT THAT HAS BEEN: (1) MODIFIED, ALTERED OR SUBJECTED TO ABUSE, NEGLIGENCE, ACCIDENT OR COLLISION; (2) IMPROPERLY INSTALLED ON ANY VEHICLE FOR WHICH IT WAS NOT DESIGNED; (3) INSTALLED ON ANY VEHICLE THAT HAS BEEN MODIFIED; (4) INSTALLED ON ANY VEHICLE THAT HAS CARRIED LOADS IN EXCESS OF THE AUTOMOBILE MANUFACTURER’S SUGGESTED WEIGHT LIMITS; (5) INSTALLED ON ANY VEHICLE THAT HAS BEEN USED FOR RALLYING, RACING, RACING-TYPE ACTIVITIES OR OFF-ROAD USE; OR (5) PRESENTED FOR WARRANTY COVERAGE AFTER BEING USED ON A VEHICLE OTHER THAN THE VEHICLE ON WHICH IT WAS ORIGINALLY INSTALLED. THERE ARE NO WARRANTIES, EXPRESS OR IMPLIED (INCLUDING ANY IMPLIED WARRANTIES OF MERCHANTABILITY AND FITNESS FOR A PARTICULAR PURPOSE), THAT EXTEND BEYOND THE DESCRIPTION ON THE FACE HEREOF. ANY IMPLIED WARRANTIES ARE DISCLAIMED TO THE FULLEST EXTENT PERMITTED BY LAW. SOME STATES DO NOT ALLOW LIMITATIONS ON HOW LONG AN IMPLIED WARRANTY LASTS, SO THE ABOVE LIMITATION MAY NOT APPLY TO YOU. PURCHASE PRICE OF THE PRODUCT. THIS WARRANTY GIVES THE CONSUMER SPECIFIC LEGAL RIGHTS. THE CONSUMER MAY HAVE ADDITIONAL RIGHTS THAT MAY VARY FROM STATE TO STATE. This warranty information and the specific warranty information included with the Product constitutes the entire agreement between DFG Tuning LLC and Consumer and exclusively determines the rights and obligations of the parties, any prior course of dealing, custom or usage of trade, or course of performance notwithstanding, and supercedes all prior agreements and understandings, whether oral or written. Can’t really tell the difference in terms of sound but I paired this with a CAI and I’ve felt a huge increase in throttle response and torque. I would definitely recommend this as a supporting mod. Product took less than 15 minutes to install. I could really tell the difference in sound, response and power. Stock inlet compared to the DFG inlet. I installed this on my 2017 Golf Alltrack along with a Neuspeed intake.